Shorthand experienced its heyday in the years immediately following the Civil War. As the end of the 19th century approached, many reporters began to swear off its usefulness, saying that shorthand’s time had passed, and that it was no longer worth the significant effort required to learn it. By the early 1890’s, the century’s practice of producing verbatim speeches in the newspapers was on the wane, and this reduced the need for the most skilled stenographers. Readers preferred more interpretation of great speeches and the happenings of Congress, rather than just reading the proceedings verbatim. And, speeches were beginning to be transcribed from their prepared written copies rather than the shorthand notes of those who actually witnessed them. Often called the ‘wiggling art’, shorthand, or stenography, first emerged as a skill learned by men, hoping to advance their reporting careers in courtrooms or for newspapers. Many underestimated the time required to learn the art of stenography and overestimated the number of well-paid positions available for those who mastered it. In the early 1890’s, authorities on the subject estimated that, of the 100 young men who took up shorthand, 90 lost interest within the first six months and lacked the discipline to see their studies through. Another 5 persevered through 18 months – and became able to write about 130 words per minute, if they were of everyday use on easy topics. Another four reached the verbatim speed of 180 words per minute, as long as the topics were familiar and routine, like political addresses or sermons, or interviews with famous people on famous topics. It was estimated that only one of those 100 men ever achieved verbatim speed, regardless of the topic. As the typewriter came into more widespread use in the late 19th century, women began to find work in dictation, or recording their bosses’ memos and letters in shorthand, as amanuenses. 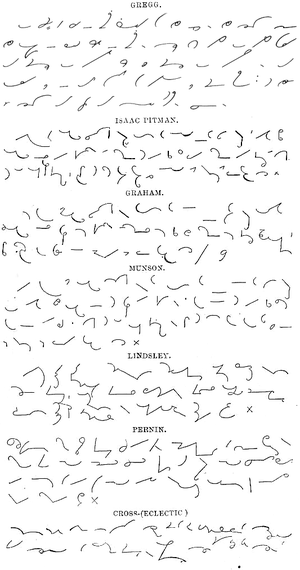 The 19th century world saw the two types of shorthand as so different that it was said that even the best amanuensis would find recording court reporting in shorthand very difficult while the best court and newspaper reporters would find the dictation work performed by amanuenses nearly impossible. The dictation work performed by amanuenses was said to require much less skill and brought lower pay. Most amanuensis work involved recording letters and memos while they were dictated by a boss or other executive. Unlike recording speeches, letters and memos were often spoken more slowly than talking speed. And, in the one-to-one meetings that often accompanied dictations, amanuenses could ask their speakers to repeat their words, or even to slow down. Also, over time, amanuenses developed professional relationships with their subjects, making it easier to record what they said, even at higher speeds. It was said that the stenographic work of newspaper men and court reporters was more difficult to learn than that of dictation shorthand. Stenographers were judged by their ability to take notes precise enough that they could then be reconstituted later into first class reporting. This, of course, required good note-taking and an understanding of the material sufficient enough to fill in the gaps. After six months of diligent study and practice, a dictation shorthand writer might be able to write 120 to 150 words per minute. During that same time, a person studying court or newspaper reporting might have just begun learning practical shorthand. The mark of a good court reporter was to avoid becoming ‘rattled’ by rapid, nervous speakers, or speakers who used unfamiliar words or phrases. Shorthand also required a good vocabulary, which aided stenographers in deciphering and recomposing their messages from their notes later. Even the most professional reporters could become rattled. Transcription of a speech also required specialized knowledge of its contents. One story well-known among 19th century shorthand men told of a reporter who recorded “Amicus Plato, amicus Socrates, sed major veritas” and then transcribed “I may cuss Plato, I may cuss Socrates, and Major Verrytus”. The pay was best in the government positions, which were few and hard to land. After that, the most lucrative work was found in the taking court cases and the pleas of lawyers. This work was mostly reserved for firms who employed shorthand men. In the early 1890’s, these men, serving as court and general reporters, could earn incomes ranging from $2000 to $1000 a year. Some earned as much as $5,000. Salaries of the average shorthand reporter usually topped out at about $40 a week; in smaller cities, these salaries topped out at $25 a week in 1892. In general, women stenographic amanuenses could command about $12 a week in the northern and eastern cities of the United States, about $8 a week in others. The best earned salaries of approximately $15 a week. Some men took work as amanuenses in hopes of advancing into roles of private secretaries and confidential men. In the 1890’s, shorthand was still seen as a valuable skill in business to be used as a stepping stone into more lucrative and influential positions. The study and use of shorthand has waned during the last several decades, as more modern recording devices have been introduced. It is still used in some medical circles for writing notes on medical correspondence or in charts, probably for the privacy that writing in a sort of code provides. And, that was actually one of the characteristics that led to shorthand’s rise. Before the Civil War, writers of shorthand mostly used it to write down their thoughts or to secretly record the discussions of others. Many used shorthand to write their own diaries and journals. I tried to pick up on Pitman shorthand, but lacked the time. Funnily enough, I’ve never actually seen what shorthand looks like till now. I took shorthand when I was in high school back in 1971. I thought it would help me take notes when I got to college. It did. I can still read it with some difficulty but I sure don’t write it anymore. Class of 1953. I took shorthand and still use it today to take notes at meetings as I serve on a Board in Florida!